In December of 2000, congress passed the Commodities Futures Modernization Act, which called for less regulation on Wall Street and, according to a former director of the Commodity Futures Trading Commission, "freed Wall Street to essentially shoot itself in both feet." Eight years later, the US economy is crumbling, and trapped under its wreckage are the American homeowners and taxpayers. Politicians love to talk about the disconnect between Wall Street and Main Street, but American Casino director Leslie Cockburn gets to the crux of the matter, eliciting candid revelations from defectors from Bear Stearns and Standard & Poor's and other high-level players in the subprime mortgage gamble. On the flipside, she gives a voice to the minority Americans on "Main Street"—a high school teacher, a therapist, a minister—who were the unwitting chips in this high-stakes game of chance. 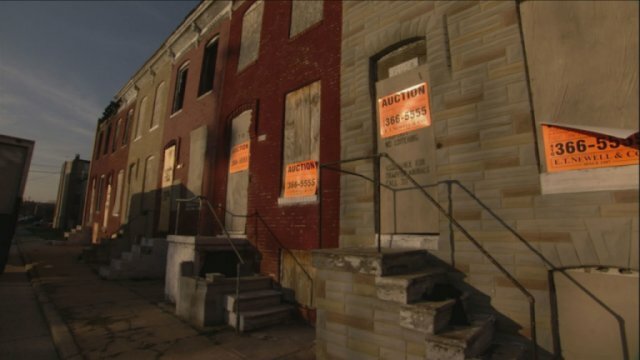 Scored to the tune of eloquent hip-hop numbers like "Foreclosure Song," created especially for the film, the filmmakers cruise past rows of freshly boarded-up homes in the mostly minority neighborhoods of Baltimore and Stockton, California. Here, foreclosure and property neglect have led to the spread of drugs, crime, and disease. And, lest we forget, Cockburn reminds us that it's the Main Street Americans who are now bailing out the financial institutions responsible for the fall.